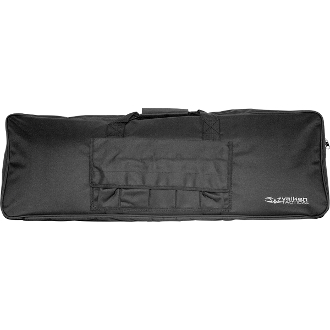 This Gun Bag the perfect size for holding your full-length rifles and most sub machine guns. The interior of the bag is padded and features hook & loop straps to help keep your gun secure. The exterior of the bag features two carry handles, and five extra pouches with hook loop flap closures for carrying extra bb's, grenades, magazines, or almost any other accessory that you may need on the field.